We want to change this so that we get a describing text with a button to open the section, as shown in the screenshot for Portfolio feature. For that, we use the customize_controls_print_footer_scripts action and hook our hannover_customize_templates() function to it. In that function, we create the markup for our section head inside a script element. The ID of the script has to have the prefix tmpl-, so the template can be used via JS later. 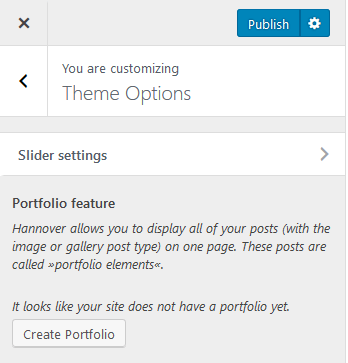 After the customizer is ready, we search for the .accordion-section-title in the head container of the section we want to modify (in our case hannover_portfolio_page_section). We replace it with our template, which we can call via wp.template('hannover-no-portfolio-page-notice'). The param for wp.template has to be the template id without the tmpl- prefix. Then we add a click event listener to the button and open the section after the button was clicked. The middle part is known, and at the beginning, we just save the HTML of the head container of our section in a variable. At the end of the code, an event listener is used again to restore the HTML after a button click. To do this, we assign the saved original markup to the innerHTML of the head container element and must then create an additional event listener to open the section after clicking on the section title.